Picketers circle in front of Moscone Center West to protest Google during the I/O conference on June 25. Photo by Frank Ladra/Bay News Rising. Tech giant Google once used the slogan “don’t be evil” as a company motto. Coined to project its corporate values, the slogan has since been retired. Now it has returned with a twist, as a rallying cry to San Franciscans who believe the mega-firm is failing to take responsibility for negative changes it is bringing about in their city. Supervisor John Avalos stood with the protestors, drawing cheers as he addressed the crowd. 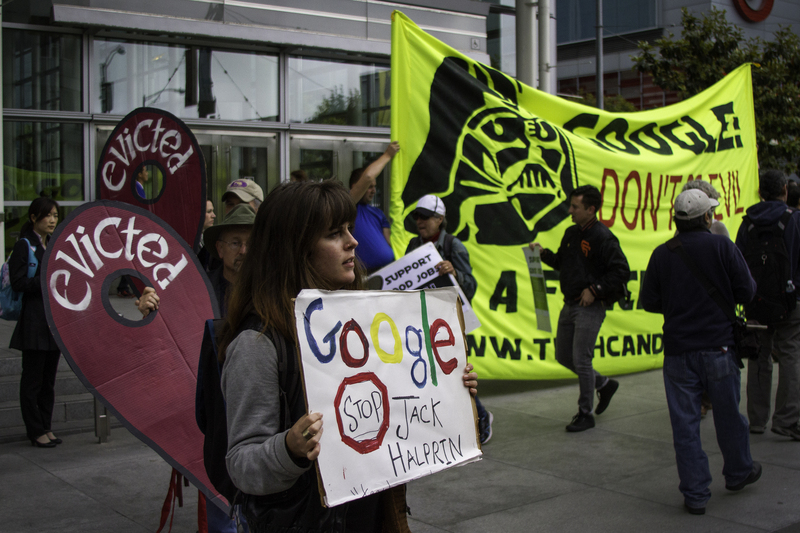 Google sustained a public relations black eye after news emerged that its attorney, Jack Halprin, bought a seven-unit flat on Guerrero Street and used the Ellis Act to evict all the tenants and create a spacious private home for himself. Protestors holding signs that mimic Google placemarkers march in front of Moscone Center West to protest Google during the I/O conference on June 25. Photo by Frank Ladra/Bay News Rising. 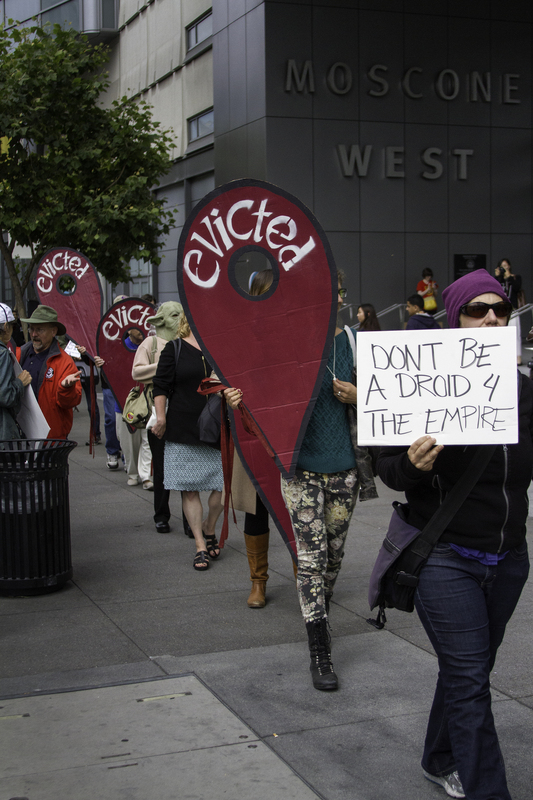 As evictions continue to rise, many residents of San Francisco are pointing their fingers at the tech boom that has swept the city. According to the San Francisco Rent Board annual report, from March 1,2013 to Feb. 28, 2014, landlords filed nearly 2,000 eviction notices, up 220 since 2013 and climbing. Claudia Tirado, one of the Guerrero tenants, is fighting back. The mother of a 31-week-old son, Tirado said she was devastated to lose her home. Shanell Williams, a 26-year resident of San Francisco and Jobs For Justice activist, says the situation is not hopeless. “I believe we have the resources for our city to remain diverse,” Williams said. Google released a statement regarding the protest. Additionally, Mission Local reports that the tech giant’s vice president of communications, Rachel Whetstone, has promised to “help out” Tirado. The plea for a change in San Francisco is only getting growing louder. “We have all this wealth that going to the wealthy, not going back into our neighborhoods,” Avalos said. Avalos and others want to see more community investment by the many tech firms that have set up shop in the bay area.